Cross River Cultural Heritage: reports from home and from the African Diaspora: Tata Ikpi (1959-2018): "Each person sees his own Ékpè"
Tata Ikpi (1959-2018): "Each person sees his own Ékpè"
Chief 'Tata' Ikpi with Miller, holding a copy of Voice of the Leopard, Ugep, 2015. 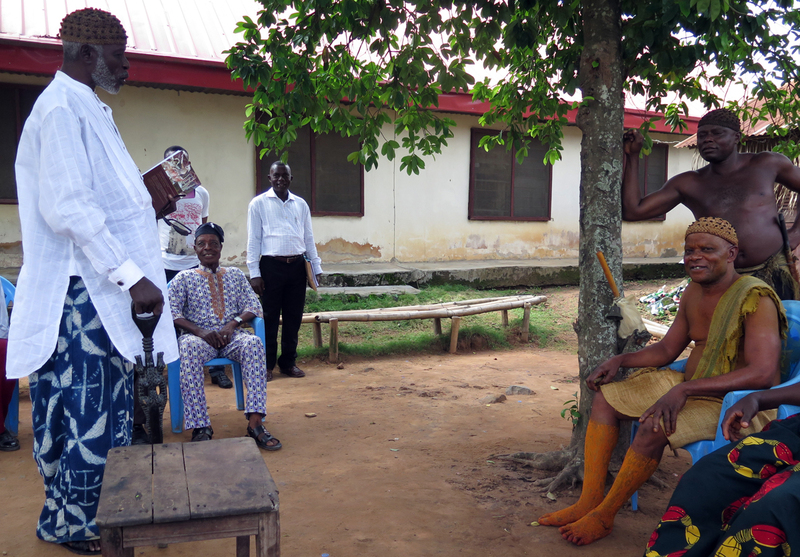 Chief Eteng ‘Tata’ Ikpi, the Iyamba Ékpè of Lebolkom village in Bikobiko Ward of Ugep, generously introduced me to the Ékpè culture of his community, and throughout the entire Middle Cross River region. Tata's concern for the living heritage of his people made him an ally in my research to understand the West African sources of Cuban Abakuá practice. 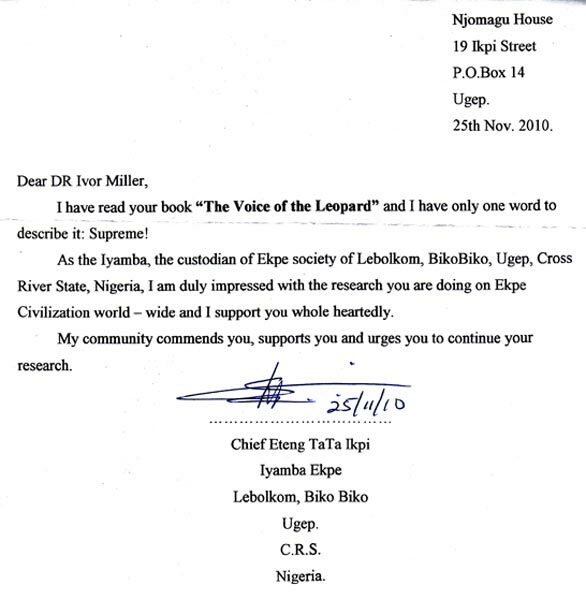 After meeting in Calabar through mutual friends in 2010, Tata read my book Voice of the Leopard, becoming an enthusiastic supporter of the project. 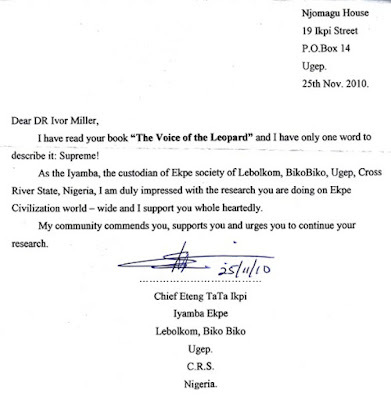 First, he wrote a letter in support of the book, which helped lead to the publication of a Nigerian edition by The Centre for Black and African Arts and Civilization (CBAAC) in Lagos, 2011. Secondly, Tata guided me to meet leading custodians of Ékpè in the Yakurr L.G.A. area, to understand its functions, history and protocols. This was important, because leaders of Calabar communities were not generally aware that Ékpè exists in the Yakurr region. Research began by presenting me to the Obol Lopon (Village Head) of Ugep to announce my research plan. 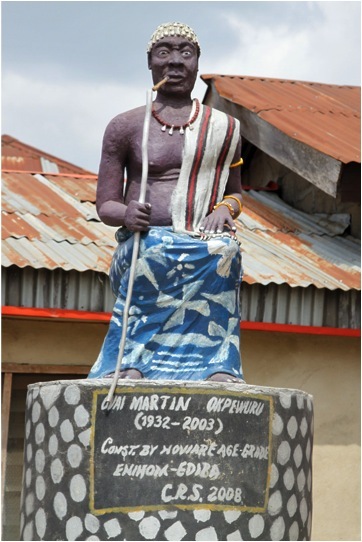 In reference to a statue in front of his palace of "Mma Esekpa, the Great Mother of Ugep Eburutu," the Obol Lopon explained that a vital feature of Ugep is the spiritual presence Mma Esekpa, a founder of the Ugep community centuries ago: "Mma Esekpa is our fertility deity, and the protector of this great community; in times of trouble, in times of invasion, she is always around the Ugep people, and she sends messages to the Obol Lopon through people who see dreams, who go into trances." 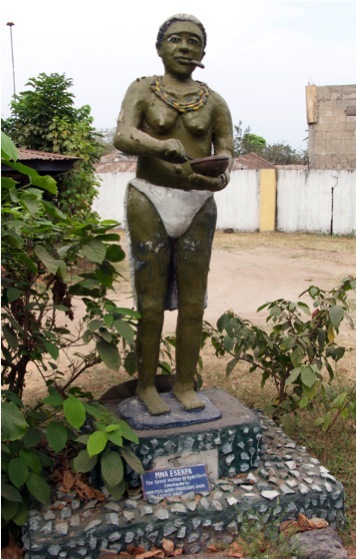 Cement sculpture of "Mma Esekpa, the Great Mother of Ugep Eburutu." Palace of the Obol Lopon, Ugep. I. Miller photo, 2010. 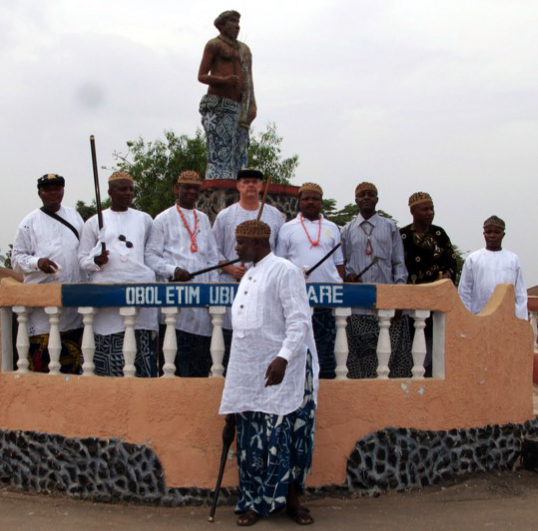 Tata Ikpi, front, with Ékpè chiefs of Ugep and Miller, at Obol Etim Ubi Square, Ugep, 2010. 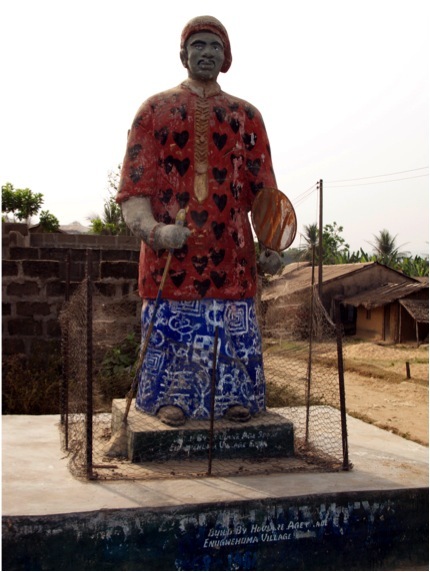 Tata was helpful to other scholars working in the Ugep area, like Dr. Gitti Salami, who wrote many articles about Yakurr culture, some of them about artists who created cement statues, as seen in many monuments pictured here. 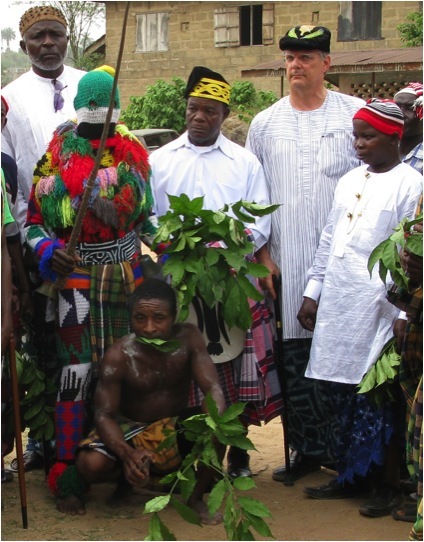 Ute Röschenthaler's extraordinary book about the diffusion of initiation clubs in the Cross River region acknowledges "Chief Tataw (Obong Ekpe of Bikobiko-Lebokum quarter)" of Ugep for help during research (Röschenthaler 2011: 553). Cement statue of former Idomi community leader wearing ùkárá Ékpè cloth, Idomi, Yakurr L.G.A., I. Miller photo, 2010. 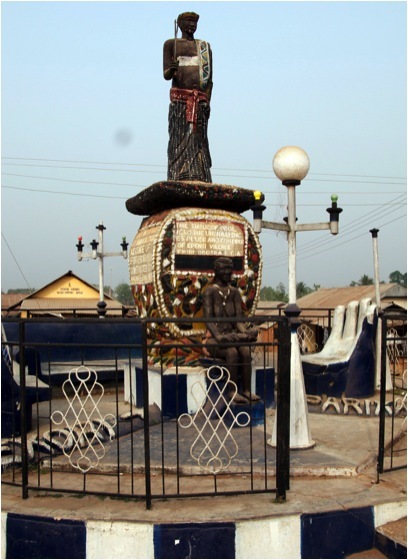 “Obol Igbo, the Unchallenged Ruler and Founder of Épèntì Village, Ekori Obubra, L.G.A.” Ekori, Yakurr L.G.A. I. Miller photo, January 2010. Ovai Martin Okpewuru (1932-2003), Ediba community, Abi L.G.A. I. Miller photo, 2010. “Ovai Ina Eyo (1863-1956).” Enugwehuma village, Abi L.G.A. I. Miller photo, 2010. Even though a father is an Ékpè member, the son may not be eligible. One doesn’t just decide to be initiated into Ékpè: one's father, uncle, brother, or a close relative who is an Ékpè member must die, and then the Ékpè members will ask that family to produce a member. They will screen that selected person rigorously, because in Ugep, only the worthy may enter, because the function of Ékpè there is primarily judicial. 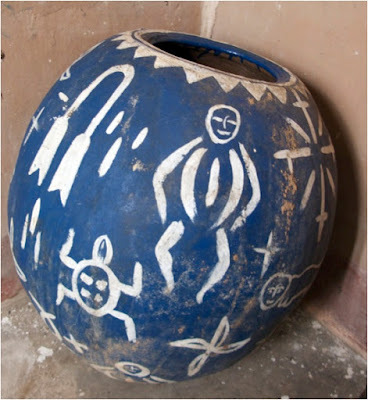 Palm wine terracotta vessel for Ékpè members, archives of 'Tata' Ikpi. I. Miller photo, 2010. 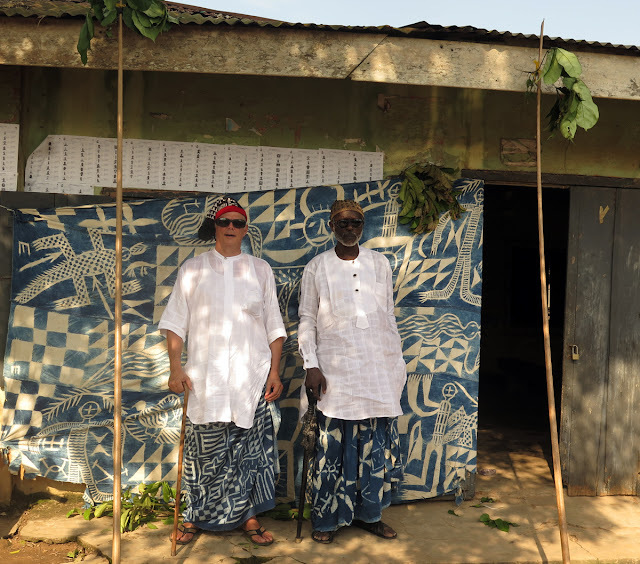 On one occasion Tata and I transversed the Cross River to join an Ékpè celebration in Afikpo, to honor Máàzí Otu, a son of Afikpo who had lived in Ugep for 28 years as a pharmacist, was married to an Ugep woman, and became an Ékpè initiate in Ugep. Tata Ikpi, Ezeogo Brendan Otu, Ivor Miller and Máàzí Otu, Orra, Afikpo, 2010. One day Tata phoned me in Calabar, instructing me to "drop whatever you are doing and come straight to Ugep, there's an Ékpè event in a nearby village." It turned out to be the penultimate day in a seven year ritual cycle of Agoi-Ibami, when Ékpè 'escapes into the bush', and for three months, the entire community searches for the 'spiritual leopard', which can only be captured with the aide of the women leaders of the community. Tata Ikpi standing on the Ékpè stones of Agoi-Ibami to chant his status. I. Miller photo, 2010. Agoi-Ibami had an unusually rich Ékpè culture, including complex nsìbìdì signs, and the participation of young, old, men and women in its seven year cycle, so I later returned many times to work with community leaders to document their practices. 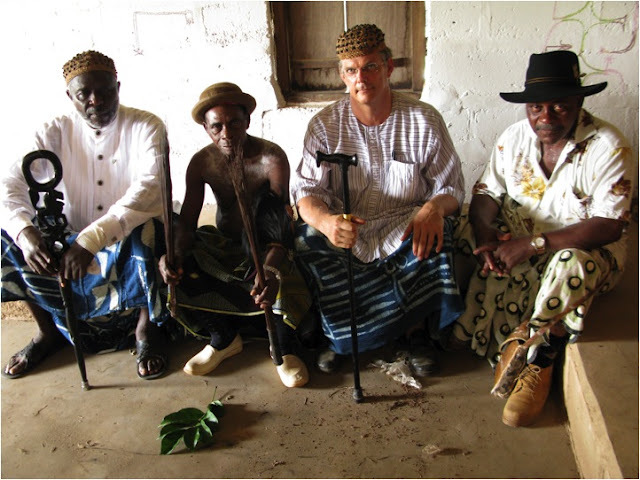 Ikpi, the local Iyamba, Miller, and Andong, in the Agoi-Ibami Ékpè hall, 2010. 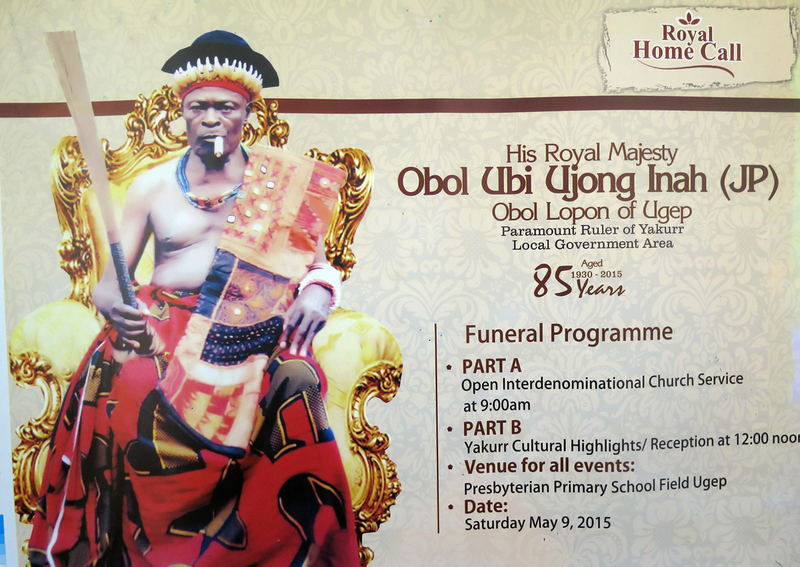 Funerary rites schedule for the Obol Lopon, Ugep, 2015. I. Miller photo. When the Obol Lopon passed away after many decades of leadership, Tata invited me to the funerary rites, which included the Ékpè initiation of the new Obol Lopon, where he presented Voice of the Leopard to the incoming paramount leader. Tata presents Voice of the Leopard to the Obol Lopon during his Ékpè initiation rites. I. Miller photo, 2015. 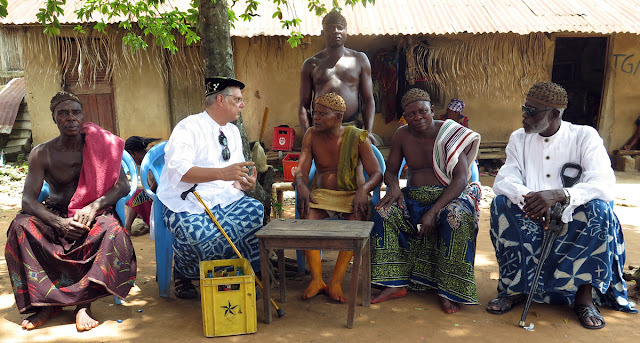 Miller discusses Cross River region heritage with the Obol Lopon, Ikpi and other chiefs, Ugep, 2015. “Replacing his father in the Ékpè Society, he cherished it so much and learned its doctrines fast. 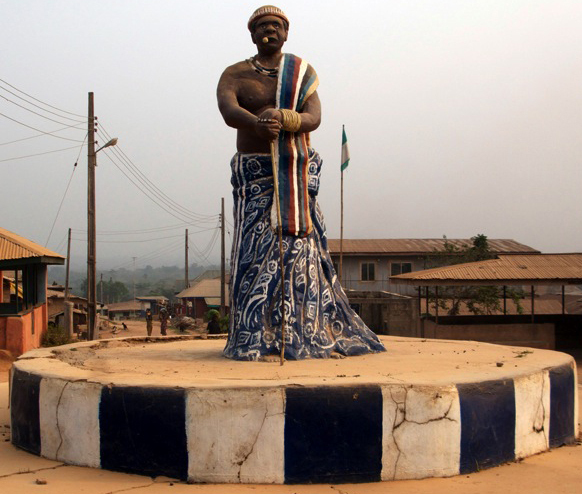 It therefore did not take him much time to become the Obong Ékpè of Lebolkom, Bikobiko – Ugep. 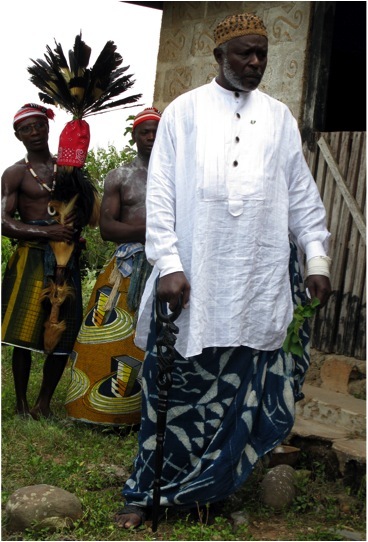 As Obong Ékpè, he doubled as the Youth leader or better still, Chief of the youths for a long time. During his reign as many here present can testify, indiscipline generally among youths in Lebolkom was reduced to the barest minimum. You dare not involve yourself in any misconduct or indiscipline. If you do and you are brought before Obong Ékpè and his Youth Council, and your crime is proven true, the devil that sent you will be the same devil to come and rescue you. His reign brought about peaceful co-existence among his people and community, just as he also championed a clean, healthy and hygienic environment for sustainable growth and development. 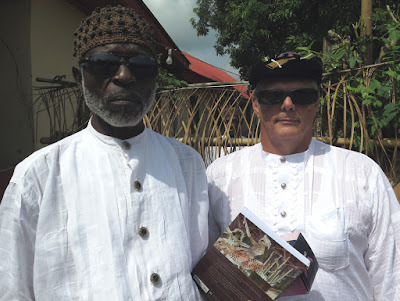 Tata and Miller during an Ékpè rite, Ugep, 2014. Sám kání (thanks very much) Tata!, you changed the lives of many in positive ways; you acted responsibly as a leader and role model. Your example will help those privileged to know you to carry on and emulate your example! Miller, Ivor. 2009. Voice of the Leopard: African Secret Societies and Cuba. U P of Mississippi. (2011, Nigerian edition by the Center for Black and African Arts and Civilization [CBAAC], a parastatal under the Federal Ministry of Information and Culture). Röschenthaler, Ute M. 2011. Purchasing Culture: The Dissemination of Associations in the Cross River Region of Cameroon and Nigeria. Trenton, NJ: African World Press. Salami, Gitti. 2013. 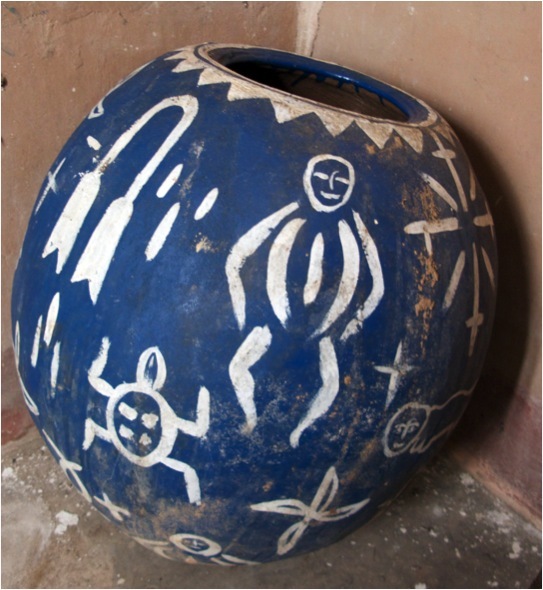 “Concrete Aspirations: Modern Art at the Roundabout in Ugep.” A companion to Modern African Art. Eds., G. Salami & M. Blackmun Visona. Oxford: John Wiley & Sons. Interview with Obol Lopon, His Royal Highness Obol Ubi Ujong Inah (born 1930), the Obol Lopon of Ugep and Paramount Ruler of Yakurr, September 12, 2014. Revised by Chief Paulinus Eteng 1 (born 1935), the Secretary to the Obol Lopon.